In the wake of the publication of his memoir of life in the IRA – Southside Provisional – From Freedom Fighter To The Four Courts – Kieran Conway last week gave a twenty minute or so radio interview to RTE’s Sean O’Rourke which can be heard here. Towards the end he explained in a little more depth the sequence of events that persuaded him to leave the IRA (he was also a member of Sinn Fein) on the same day that the Downing Street Declaration was unveiled at Downing Street on December 15th, 1993. Q – What about where it all ended up? 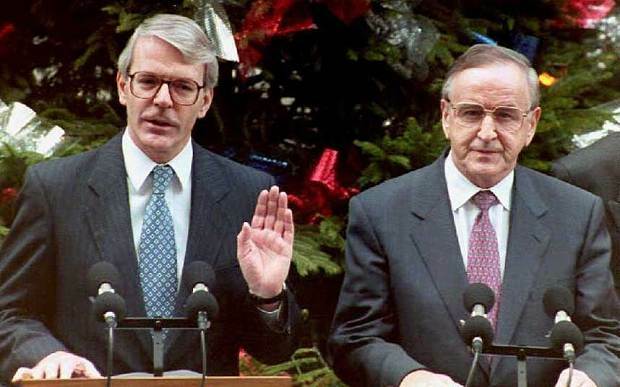 Not just the Downing Street Declaration, John Major, Albert Reynolds but the peace process, the Good Friday Agreement; do you think that was a good outcome? A – I don’t. It certainly wasn’t the outcome that people died for, and that people killed people for. So the outcome is a disappointment to me but it is two decades on and my bitterness has abated somewhat. Q – Why did you leave on the day of the Downing Street Declaration? A – I left on the day of the Downing Street Declaration because…..I was down at the An Phoblacht office with a lot of other people watching it. We expected certain things to be said. We expected in particular some sort of indication of a British interest in leaving Ireland. That didn’t happen. Then a call came through from Belfast and the caller, who was Gerry Adams, said that people should settle down, that they could work with it and I thought ‘right….’. The gloom in the room evaporated and I thought ‘right, I’m off…..’ and went home. A central thesis of my study of the IRA’s journey to the peace process, ‘A Secret History of the IRA’ is that there was in fact two peace processes in place during the 1990’s, one that IRA activists like Kieran Conway thought was happening and another, kept hidden from most republicans, which is the one that Gerry Adams and his close confidantes in the Provo ‘Think Tank’, Fr. Reid and the two governments had developed and which ultimately triumphed. The peace process of Kieran Conway et al was supposed to culminate in a Downing Street Declaration (aka the Hume-Adams Agreement) or some equivalent document which would commit the British to withdrawal from Northern Ireland and to a timescale for that to happen, although the IRA Army Council had conceded that this could be many years in the future. The real Downing Street Declaration, the one that persuaded Conway to walk out of the An Phoblacht office that December day, not only gave no such commitment but it actually enshrined and, arguably, cemented the principle of Unionist consent as an agreed pillar of inter-governmental policy on the North. There was no timescale for British withdrawal and instead the Provos would be wedded to the notion that Ireland could never be independent and united until or unless the Unionists agreed – a principle they had spent nearly twenty-five years trying to overturn. Unless they walked away and resumed their war. This mural, which reflected the real mood of grassroots Provos, appeared on the Falls Road in the wake of the Declaration but it was soon painted over. That option, most likely, reflected the mood in the An Phoblacht office as Kieran Conway and his colleagues watched events unfold in London. Until the call came in from Gerry Adams to re-assure people that “they could work with it” and the despair lightened. The Army Council felt the same way as the pre-Adams’ phone call crowd in the An Phoblacht office. It voted to reject the Downing Street Declaration but Adams managed to persuade the Council to keep the decision secret. At the same time the IRA & Sinn Fein rank and file was assured there would be no ceasefire. That bought precious time which the various governments used to sweeten a very bitter pill and effectively to make rejection by the Provos a very expensive option. It also created space for Adams and his allies to nudge their colleagues towards inevitable acceptance. So the days, weeks and months after the Downing Street Declaration saw an elaborate dance unfold whose ending was almost pre-scripted. Irish prime minister Albert Reynolds repealed Section 31 of the Broadcasting Act, meaning that Provos could, for the first time in three decades, appear unfettered on the national airwaves while US President Bill Clinton allowed Gerry Adams to make a four-day trip to New York. There Irish-America feted him as re-born Eamon de Valera and the US media treated him as an irish Che Guevara. The fact that the British objected – or perhaps acted as if they objected – to the visa was a bonus. Going back to war after such concessions, which is what rejecting the Downing Street Declaration meant, would justify the most extreme repression of the IRA by the British and Irish governments – with American approval – and everyone knew it. Rejection of the Downing Street document would bring military defeat and almost certain political isolation. [The Taoiseach] accepts, on behalf of the Irish Government, that the democratic right of self-determination by the people of Ireland as a whole must be achieved and exercised with and subject to the agreement and consent of a majority of the people of Northern Ireland?). In the wake of the Downing Street Declaration, the Adams Think Tank devised the TUAS strategy for a pan-Nationalist alliance consisting of Irish government, SDLP and Sinn Fein which together would pressure the British to move in the right direction (whatever happened to that idea by the way?). The TUAS acronym was cleverly devised. Appropriate for a peace process that was full of double meaning not to mention dissimulation, the Provo grassroots were told it stood for Tactical Use of Armed Struggle while the media, governments and so on were led to believe it meant Totally UnArmed Strategy. Its effect internally was to calm grassroots nerves, suggesting that renewed warfare was still a possibility, while re-assuring the governments and the media that alternatives to violence were under discussion. Nothing captured the ambiguity and double meanings of the peace process better than that four-letter acronym. Together all of these responses, from the governments and from the Provo leadership, were sufficient to muddy the waters, buy time and create the atmosphere within which the ceasefire of August 1994 could be called. By the time that happened, the Downing Street Declaration had been all but forgotten, its effective acceptance by the Provos quietly accepted all round. Kieran Conway’s account describes how the Provo side of all this started, at least in the Dublin headquarters of Sinn Fein, and places Gerry Adams firmly in the role of persuader and enabler. One can only imagine that this was only one of many phone calls made by the Sinn Fein president that day. Such an insight demonstrates the value to future generations of exercises such as Southside Provisional. One can only hope that Kieran Conway’s example will inspire others to tell their own stories. Heres an interesting site on Kieran Conway,At present he is a solicitor and works in Dublin the site below explains one of his political court cases,the article originally appeared somewhere on the cedar lounge revolution site…..here what do you think?